When Savannah the lioness visited Julie in her den soon after the birth of the cubs, the greeting was extra-ordinary to say the least (Savannah is the lioness that was introduced into Julies first litter when she was 5 days old. This was a genetic diversity experiment which was extremely successful. See newsletter No2). Savannah, now 3 years old, enters the den, greets, rolls and grooms Julie for more than 2 hours. I could relate to the greeting because a lioness called "Shingalana" had given me a similar greeting on the Luwangwe River in Zambia after I returned from an absence of 3 weeks due to a severe bout of Malaria. The problem with Savannahs' greeting is that having never produced cubs of her own, she is totally oblivious of the fragility and vulnerability of the cubs. 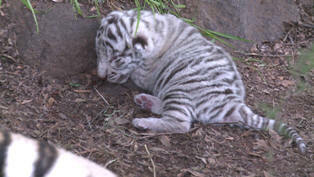 If Savannah (roughly 160kg) rolls on top of a 1kg tiger cub, the cub will be killed instantly. I watched in horror as several times the cubs were almost crushed by the ecstatic Savannah. Further observation revealed a degree of jealousy as Savannah roughly cuffed and rolled the cubs over with her paws. Whereas Savannah was overjoyed to see Julie, the cubs were regarded as competition as instinctively Savannah knew that the cubs would now replace her for Julies attention, and affection. Then the most extraordinary thing happened. As Julie rolled on her side to give the cubs better access to the teats, Savannah tried to suckle from Julie too. In one of the most extraordinary shots I have ever rolled, a 3-year-old lioness lies next to 5 tiny, newborn tiger cubs and attempts to suckle. Fearful of damage to a cub, I was forced to remove Savannah into a holding boma. I returned to the den and my worst fears were realized. 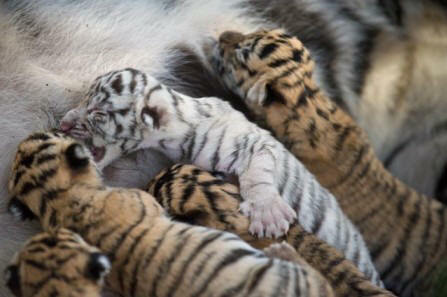 The white cub lay separate from the 4 normal cubs. Its head was thrown back and it was gasping for air. It appeared unable to crawl. It seemed traumatized. I picked up the cub to examine it and noticed it had diarrhea. Could Savannah have crushed the tiny cub and damaged its internal organs? Shock, and dismay overcame me as I realized that the chance of Julie raising a wild white tiger had been snuffed out in the first few days. I left the cub in the den, and returned to camp. That night I phoned many vet friends of mine and the consensus of all of them was that the cub had suffered a severe blow to the body and had probably been sat on by Savannah. At 3am in the morning my "non-interference" went out of the window and I woke Jade de Klerk to help me pull the cub and rush it to the vet in an attempt to save its life. Using lights we arrived at the den. 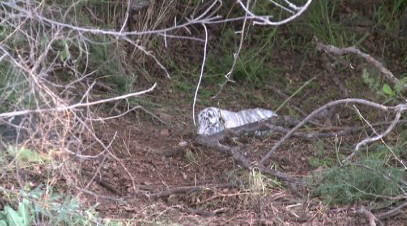 The white cub had not moved. My heart sank. Julie had her paws over the cub, and it appeared to be dead. I waited for 5 minutes, but there was no sign of life in the white cub. Completely gutted, I prepared to leave the den. Suddenly, the white cubs head pushed through Julies paws, crawling over her leg trying to find a teat, then it began to suckle. 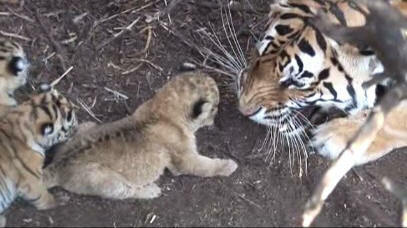 Amazement is an understatement, the cub was alive and feeding! We left the den elated. Several days later Julie moved the cubs from the birth den into a new den in a river bed. The new den had thick reeds and access was difficult. On the third day I arrived to find the white cub alone in the den. Julie and the 4 normal cubs were gone. I was unconcerned, Julie was obviously in the process of moving the cubs to a new den site and she would return to the den shortly to fetch the last cub. Julie, however, never returned to the den. The longer I waited, the more I became convinced that she had forgotten the last cub. I have seen it many times before with leopards, they will move their cubs to a new den and then go back to the original den and call in case there is another cub. In other words they cant count, they simply act on instinct. I became convinced that Julie, having carried four cubs in her mouth, had forgotten one, and once again it was the white cub. 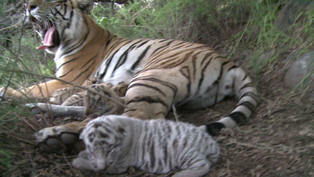 My dilemma was; do I leave the cub or do I pick up the cub, try to find Julies new den and return the cub to the litter. 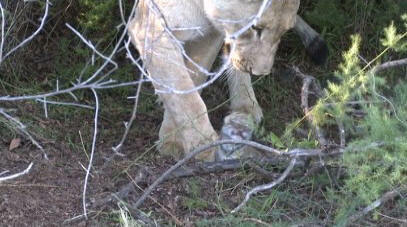 Another scenario was possible, did Julie deliberately leave it behind knowing that she couldn't possible raise 5 cubs? 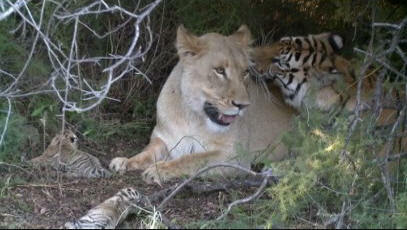 If this was the case, then should I pick up the cub and hand-rear it leaving her with the 4 normal-coloured cubs. If only I could communicate with her. If only she could tell me her strategy, if only.......? If the second scenario was correct then I should pick up the white cub and hand-rear it. This then ensures the survival of the white cub and lightens the load on Julie, which then increases the chances of survival of the other 4 normal cubs. Scientists have long told me that to do good science, one must remain totally objective and unemotional. However, when it came to the crunch, Dian Fossey ended up holding hands with her gorillas. Jane Goodall freely admits to becoming emotionally involved in her chimpanzees. In short, human beings are the most emotive animals on this planet, highly creative, highly destructive, but super-charged by emotion no less. In fact, in Julies case, the normal cubs were in a new den just 3m to the West of the old den. The normal cubs were so well camouflaged and silent that I had failed to see them in the dappled light of the thick reeds. Much later, Julie was reunited with all her cubs and began immediately to suckle them. Therefore my non-interference in the first and second case had been the right decision! Let me rephrase my policy; "I desperately hope that Julie can raise all five cubs, but logic tells me the odds are against her. When crisis arrives I'm sure emotion will overtake me and I will interfere. 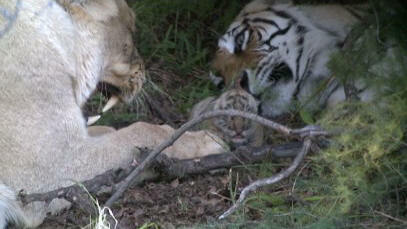 The fact that there is a white cub involved, makes the emotions all the more powerful." 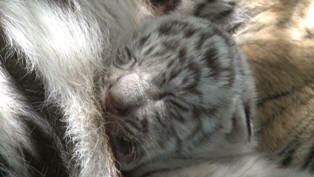 Many people from around the world have urged me to hand-rear the white cub to ensure its survival. Others have urged me to hand-rear 2 normal cubs, to help the white cub survive in the wild, by lessening the competition for milk. The concern from across the world shows how emotionally-charged, human beings are.